A sumptuously photographed guide by the first lady describes how her daughters and she planted a vegetable garden on the White House's South Lawn as part of an initiative to raise awareness about childhood obesity, in a reference that shares gardening tips, recipes and advice for making healthier food choices. idea of from day one. lady. Children, nutrition, good healthy food and living. I will pick this up many times in the future. It is perhaps readily apparent that this audiobook lies way outside the scope of my ordinary reading. Way, way outside. However, since it was given to me, I resolved to listen to it, despite my lack of interest. I expected to be bored to tears with gardening tips, but it really wasn't that bad. Not exactly a glowing commendation, but, considering how little the subject matter has to do with me, that's fair praise. The focus does lie primarily on gardening, with tips for how to create and maintain the garden, as well as how to know when to harvest. Amateur gardeners could certainly find this a helpful resource. Along with that, there's quite a bit of interesting history. The book does feel a bit convoluted, though, with sudden jumps from story to story. This could have been much better organized. More interesting to me, though, were the parts where gardening took a back seat to Michelle Obama's work as a whole. This audiobook clearly serves to promote her ideas about gardening, healthy foods and obtaining exercise. Certainly, I am one of those people who could benefit from listening to her, and I admire her passion and that she's actively working on improving the country. 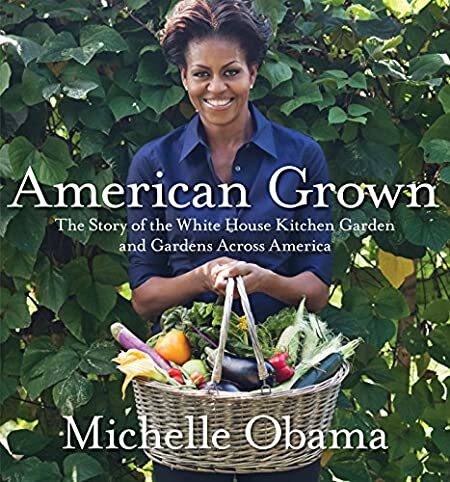 Though I am not the ideal audience for American Grown, I recommend it highly for those interested in starting a garden or in Michelle Obama's efforts to create a healthier United States. Michelle Obama does the bulk of the narration, and I credit her with keeping me from utter boredom. She has a very beautiful voice, and it's so full of her passion and commitment to her cause. You can hear how much she cares in her narration, and it made everything much more meaningful than it might have been had some other narrator been hired.